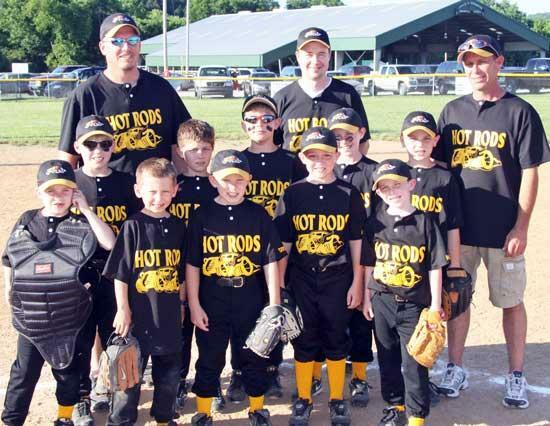 The 7-8 year-old Coach-Pitch Hot Rods are comprised of Garett Alexander, Hunter Harris, Eddie Hill, Michael McCord, Brandon Miles, Jake Raines, Branden Schwartz, Brady Sissom, Austin Taylor and Davin Wilson. The team is coached by Scott Schwartz, That Raines and Scottie Sissom. The saying is, "Practice makes perfect," and for a team of Cannon County 7-8 year-old Coach-Pitch players the motto almost held true during what has been a fabulous 2010 season in the Cannon County Youth Baseball League. The Coach-Pitch Hot Rods, coached by Scott Schwartz and Thad Raines, reeled off 13 straight wins before finally staring into the face of defeat. That first loss came against the rival Bulls last Tuesday (5/25) at the Fairgrounds on a night when the park was bustling with activity and most eyes were on the Hot Rods as they continued their pursuit of perfection. There is also a saying that no one (or team) is perfect and on that night, the young Hot Rods learned that valuable lesson. "I think they need to learn how to win as well as how to lose," said Coach Schwartz, who is in his fifth season coaching youth baseball. "They need to learn from both ends of it because no one wins all the time and you need to understand how to lose too. I'm just here for the kids and want to make it fun and enjoyable for them." It has, indeed, been a fun and enjoyable season for the Hot Rods, who were mostly dominant on their way to the 13-0 start. During that stretch they scored 15 or more runs nine times, including 20 or more in five games. Even while they were seemingly invincible the players realized they were conquerable. In fact, numerous players said they were surprised to have won all of their 13 games before being tamed by the Bulls. Team members include Garett Alexander, Hunter Harris, Eddie Hill, Michael McCord, Brandon Miles, Jake Raines, Branden Schwartz, Brady Sissom, Austin Taylor and Davin Wilson. "I'm really surprised we have been this good," said stellar standout Jake Raines. "I thought we would lose some games because there are a lot of good teams and there are good players on those teams. I think we have done really good this year, better than we thought we would. We just show up every day to play ball. That's what we do." And they do it very, very well. There's a reason though and it's rather clear why these NAPA Hot Rods appear to click on all cylinders when they get on the game field. What's the secret to success? "Practice, practice, practice," third baseman Brady Sissom said. "We practice hard and we play hard." "Practice is what has made us so good. It's the No. 1 thing," said first baseman Branden Schwartz, son of manager Scott Schwartz. "I am surprised at how good we have done. I thought we would be pretty good, but not this good. I guess no one is perfect." Practice may be the overwhelming factor for the team's success; however, there are other variables. Several of the players have been together two or more years and many of the Hot Rods on this year's roster are older players. In fact, eight of the 10 are in their final year of Coach-Pitch so this team definitely has experience that matters. "At the start of the season I knew we had a chance to be pretty good because we have a lot of older boys," Coach Schwartz said. "They have played together and they just have the ability to do it. They don't have the big head. They are just a good group of boys that want to play ball. They don't show a lot of excitement or disappointment depending on how it is going. They always play the same and that has made for a good experience for the players, coaches and parents." The Hot Rods spin out some guady offensive numbers but they also are rather dyanamic in the field. They turned one triple play and two double plays in the same game this season. "We do seem to play good defense," Sissom said. "We work on it a lot because it's fun when you get out there and are able to do that - turn a triple play or get people out. It's a lot more fun than getting out or striking out." The Hots Rods are one of 40 teams participating in the Cannon County Youth Baseball League this season. Teams play at fields at The Fairground Monday, Tuesday, Thursday, Friday and Saturday. Information regarding the league can be accessed at cannoncountybaseball.com. Thanks Cannon Courier for the great article. Great article!! Thank you cannon courier for your interest in Dixie Youth.